Motorists are now more twice as likely to suffer a pothole breakdown than they were 12 years ago, according to a new report from the RAC. Over the past 12 months, the RAC dealt with 14,220 pothole-related breakdowns, such as damaged shock absorbers, broken suspension springs and distorted wheels. This represents 1.5 per cent of all its call-outs during this period - the second highest percentage ever recorded since the RAC started analysing this data in 2006. The RAC’s 2018 Report on Motoring has found the state of local roads to now be the issue of greatest concern with 42 per cent of drivers surveyed in 2018 now saying it's one of their biggest motoring worry. 17 per cent of drivers cite this as their number-one concern compared to 10 per cent in 2017. In addition, two-thirds (66 per cent) of the 1808 drivers surveyed said the condition of local roads had deteriorated in the last 12 months, which represents a worrying increase on 2017 when the percentage was 51 per cent. When asked specifically for their views on the condition of the UK’s roads, 78 per cent per cent agreed the state of them – including motorways and major dual carriageways as well as local roads – was ‘generally poor’. In March 2018, the Government made £100m available to help local authorities repair potholes and storm damage that had resulted from Storm Emma and the snow that was brought by the 'Beast from the East'. "This needs to be seen in the context of the maintenance backlog of over £9.3bn reported by the Asphalt Industry Alliance (AIA), which is their estimate of the one-off investment required to return local roads to a state that is fit-for purpose," said RAC chief engineer, David Bizley. 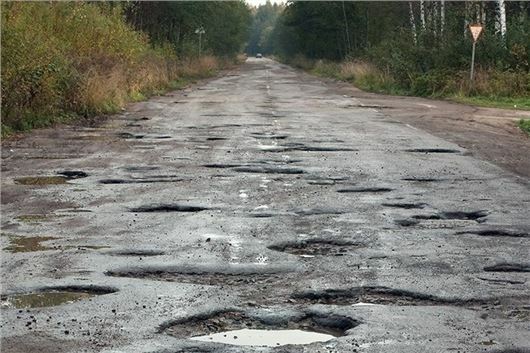 The AIA also found that around one in five local roads are in ‘poor structural condition’, which means they have five years of life or less remaining, according to the RAC. What are the state of your local roads like? Let us know in the comments below. The 1 lane "track" that accesses the back of ~30 retail units where our toy shop is located is more pothole than road. What have the council done? Allowed a new housing development at the end of this track, so massively increasing the traffic flow whilst doing nothing to widen or improve the track, the junction onto a main road (now effectively a 5 way junction), or repair the dangerously broken surface. I think this is real, but it certainly isn't helped by people blindly (and stupidly) continuing to buy cars with large wheels and low/ultra low profile tyres in such large numbers, and often going for optional extras or aftermarkets changes to make them like this. Only if we complain to dealerships about this and vote with our feet (and wallets) to avoid such specs (as well as cars without spare wheels/tyres as standard) will th motor indutsry 'get it' that we know this is a (IMHO) a scam cooked up between them and the tyre manufacturers/fitters and garages to significantly increase trade, helped by the idiots in town halls who think that we can be fleeced with no return and the speed humps and significant amounts of 'safety road furniture' (most of which does nothing to help safety, sometimes making it worse).